A collection of cases from creative producers’ everyday efforts to manage and benefit from their Intellectual Property (IP) is now available for free from CREATe and the University of St Andrews’ Institute for Capitalising on Creativity (ICC). Tales from the Drawing Board: IP wisdom and woes from Scotland’s creative industries is co-supported by CREATe, Creative Scotland, the Economic & Social Research Council, and Innovate UK. Tales from the Drawing Board focuses on the management of IP among SMEs, micro- organisations and sole traders, a sector whose encounters with the IP landscape have not been as widely researched. Creative Scotland were particularly interested in understanding strategies of this sector, in order to inform policy developments. Described in creative practitioners’ own words, the cases provide insight into how IP issues are experienced “in the wild”, as the speakers set up their businesses, plan for competitive sustainability, and innovate creative products. Their candid stories reflect on commonly encountered IP protection instruments such as copyright, registered and unregistered design rights, non-disclosure agreements, performing rights, ancillary rights, and trademarks among others. Creative industries specialist and legal practitioner Philip Hannay provides perspectives on the cases, and further content points readers toward various support resources. The tales have been selected from interviews with more than 120 creative organisations regarding their IP management and business strategies. The project complements CREATe’s portfolio in seeking to address how changes in technology and consumer behaviour present a range of IP challenges for the creative industries, particularly for the micro- to medium-sized enterprises that dominate this field. For many, the differences between innovating and creating content, and the possibilities of using IP tools to protect it, are a distant concern. Others may struggle to justify investing resources into an IP plan, but failing to do so may create difficulties for later management decisions. However Tales from the Drawing Board illustrates how such challenges typically arise and suggests how they can be addressed. Organised into sections on Computer Games, Dance & Theatre, Fashion & Product Design, Film & Television, and Music & Publishing, the cases describe practitioners’ efforts to conduct research, document for protection, form collaborations, agree licenses, set fees, develop brand strategies, self-publish, harness digital rights, and handle claims of infringement. 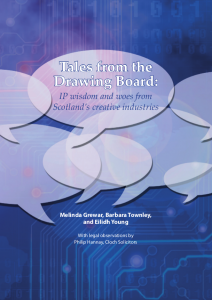 Tales from the Drawing Board: IP wisdom and woes from Scotland’s creative industries can be downloaded for free from the CREATe website or from the Institute for Capitalising on Creativity. The ICC website also offers blogs and videos from IP workshops in design, theatre and computer games which were held in 2013 and 2014 as part of the CREATe research project. The book was written by ICC Researcher Melinda Grewar, Professor Barbara Townley, and Knowledge Transfer Associate Eilidh Young. It was published in 2015 by the Institute for Capitalising on Creativity, in the School of Management of the University of St Andrews. The Institute for Capitalising on Creativity is based in the School of Management at The Gateway, North Haugh, St Andrews, KY16 9RJ. Telephone 44 + (0)1334 462808, email coca@st-andrews.ac.uk. Book citation: Grewar, M., Townley, B., and Young, E. (2015).Tales from the drawing board: IP wisdom and woes from Scotland’s creative industries. University of St Andrews: Institute for Capitalising on Creativity.